This stunning lace detail dress is both classy and fabulous. Fully lined and complete with lace detail, this dress can be worn to any special occasion, and is guaranteed to turn heads. Wear the dress alone, or finish things off beautifully with a bolero style jacket. Team with your favourite heels and simple, silver accessories to complete the look. Beautiful colour, looks elegant, the quality of the dress is brilliant, love the pattern and the lace. 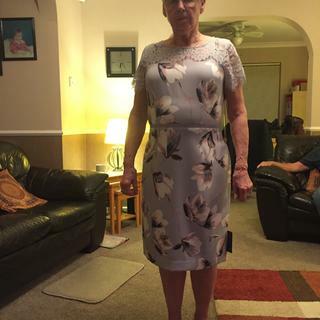 Lovely dress fits good .The dress is ideal for a wedding and don’t crease as I got to take it to a wedding abroad also the jacket looks lovely with the dress . Finished off nicely with the amazing fascinator. Bought this for a wedding, was delivered in less than 24 hours and it fitted like a glove,put it on a quick wash in the washing machine and hung it up on a hanger to dry and it still looks like new ! Lovely dress. Particularly like the lace yoke. Slight issue with zip sticking at waist by latticework. Fits well. Wanted something dressy for golf dinner and this dress fits the bill. I love this dress. It is a beautiful fit and is very smart. I would recommend others to buy it. Have bought this a wedding coming up next month. Looks great on. Great service. The description says it has lace at the bottom of the dress, but the photos don't show this. Can you confirm if it does and how much lace there is at the bottom? BEST ANSWER:There is no lace at the bottom of the dress, only the top part and sleeves. Hi I like a grey floral lace hem scuba dress and I wondered if it is in one of our local stores ? You can then call their telephone number and give the staff member the style number 14040736 so that they can check the stock levels for you.